Russian Railways is helping India’s national transporter increase the speed of its passenger trains up to 200 km per hour. Russian Railways is at present collaborating with Indian Railways on a 575-km stretch between Nagpur and Secunderabad and submitted a preliminary report last week. 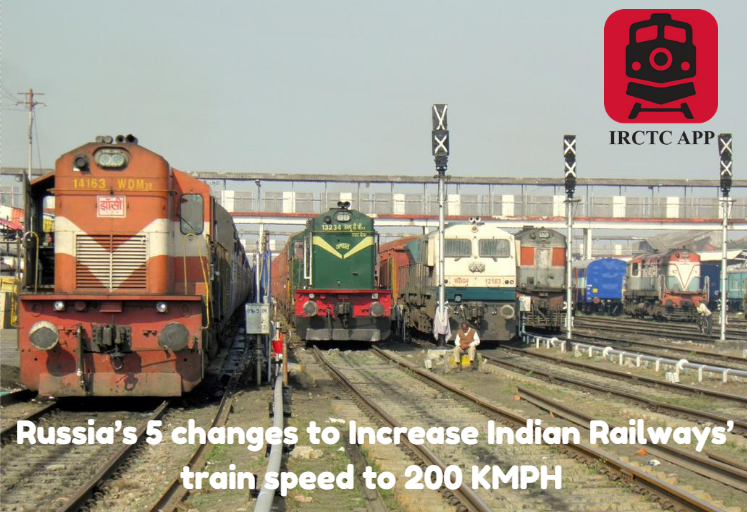 Here are 5 changes that Russia has suggested to make trains run at 200/kmph in India. Since Indian Railways doesn’t have coaches that can move with a speed of 200 km per hour, a new type of passenger cars needs to be approved as well. It has, however, expressed concern over “a number of large bridges with speed limits” on this particular stretch and has recommended a detailed survey of all these structures on the basis of which measures for reconstruction/repair will be taken up. To reach the desired speed limit, Russian Railways has proposed several technical and technological solutions, including reconstruction of railway alignment as well as treating the earth bed where there are speed restrictions. It has also been pointed out that railroad switches, which enables trains to shift from one track to another, at stations on this stretch are not suitable for a speed of 200 km per hour and a different type of switch has been recommended. A digital technological communication network for the entire section, instead of the existing radio communication, was also proposed. A high-speed rail network will also require safety measures for pedestrians and motor vehicles at rail crossings. Keeping this in mind, overpasses, anti-collision and anti-ram barriers, as well as automatic alarm systems have been suggested. A protective fencing along the length of the rail track was mooted in order to prevent accidents with people and animals on the track. The Russian Railways also suggested noise shields for tracks near residential areas. A protocol for this project was signed between the railway ministries of the two countries in October last year. The high-speed project will be jointly financed and the cost will be split equally between the two countries. Currently, the fastest train in India is Gatimaan Express with top speed of 160 km per hour.